I have a contact form that when submitted emails the form’s details and saves them to a database. I also need to add the submitted email address to a Mailchimp list. Create a hidden form that grabs the input from the form being completed. When the visible form is submitted, use jQuery to submit both forms. First, we’re going to grab our form. There are different ways of doing this, but we gave the form an ID, so let’s grab that. Once we have our form we need to write a function for when the form submits. The first thing our function should do is prevent the form’s default action. We’re then going to assign variables to the email input fields we need. 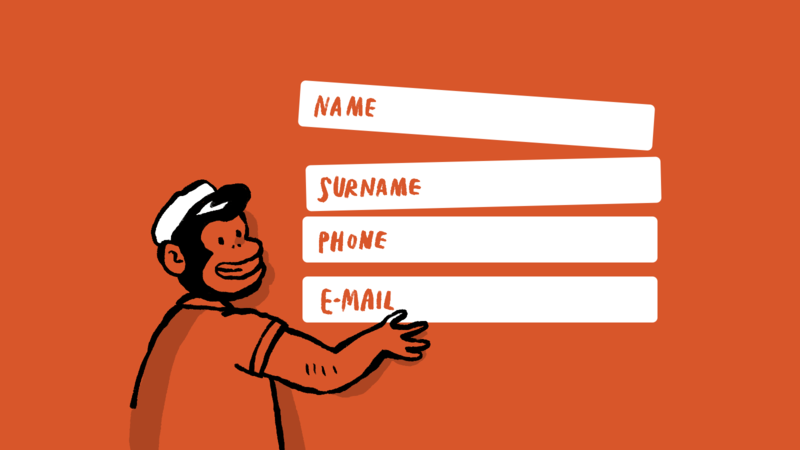 To complete this function we’ll assign the contact form email value to the Mailchimp form email input. Finally, create a callback function that will submit to Mailchimp. Note: .val() is a jQuery method that will return the value of that element if it has one. .val( value ) is a jQuery method that will assign whatever value is. Our callback function will submit the Mailchimp form. But like before we need to assign some variables and prevent the form’s default action. Then we’ll perform an asynchronous HTTP (Ajax) request using the jQuery method, .ajax(). The Ajax method will take several options/​settings. After our successful AJAX request we’ll submit our Mailchimp form, and create another callback function to submit our original contact form. Note: To get the form’s action URL we will use the jQuery method .attr(attributeName). This will return a string. .serialize() is a jQuery method that will encode form elements as a string for submission. The dataType: "jsonp" is specific for Mailchimp and has to do with the callback function at the end of the action URL. Note: We’re using .unbind( event ) to remove the previously attached event listener from our original function. Finally, we need to add a checkbox confirming the user’s consent to add their email address to our Mailchimp list, and adjust our contact form submission function to check whether that value is true or not. Now let’s update the original contact submission function to check if the user consented. Now we have a contact form with a consent input, that when checked will also submit the user’s email address to our Mailchimp list! We send one email every month with helpful articles, resources and company updates for people who manage and make websites.